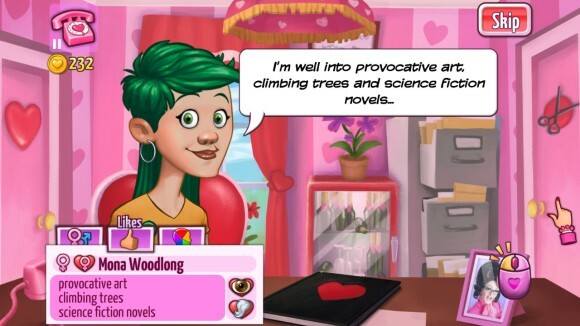 Back in my early days of exploring the wealth of indie games out there, I distinctly remember picking out a few of what I’ll refer to as ‘dating agency simulators’ (to avoid any confusion with the more recognisable genre of Japanese-style dating sims) and giving them a whirl, as you do. On every occasion I was disappointed by the shallowness of gameplay, the cheap mechanics and the near-pornographic approach these games took towards their simulation of playing with the romantic lives of innocent people. 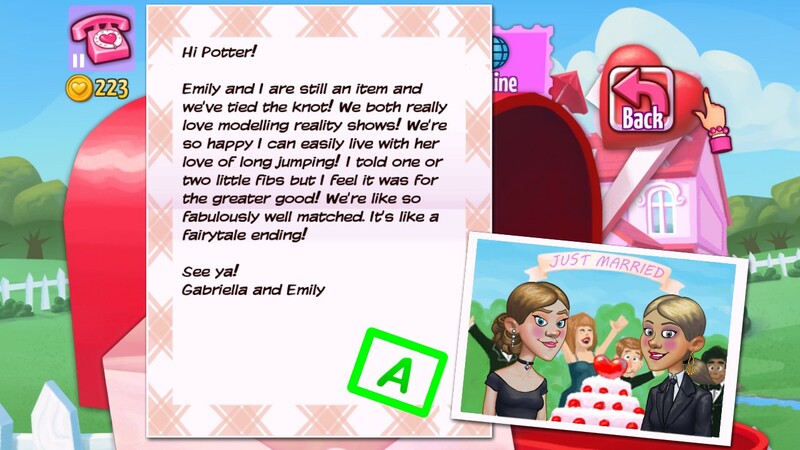 It was almost as if these dating agency sims were just cash cows aimed at a casual playerbase, which I reassured myself couldn’t possibly be the case – that it’d only be a matter of time before something was released with the in-depth gameplay and quality the genre so deserved. Approximately 10 years later and my dubiously-placed optimism appears to have prevailed: Kitty Powers’ Matchmaker has arrived on the scene and appears to have filled the long-vacant, slightly obscure gap in the market for a quality dating agency sim. You’re tasked with managing a dating agency and finding romance for innocent, unsuspecting single people from various walks of life, all with different backgrounds, sexualities, interests, appearances and desires. The game loosely pigeonholes each character into one of ten personality ‘types’, ranging from ‘Edgy’ and ‘Artsy’ to ‘Geeky’ and ‘Glam’, although it’s often left up to player to surmise which of these categories a character falls into based on their appearance and interests. Additionally, some characters can have an appearance that falls into one category and a personality that falls into another. Those are perfectly normal interests. Definitely. 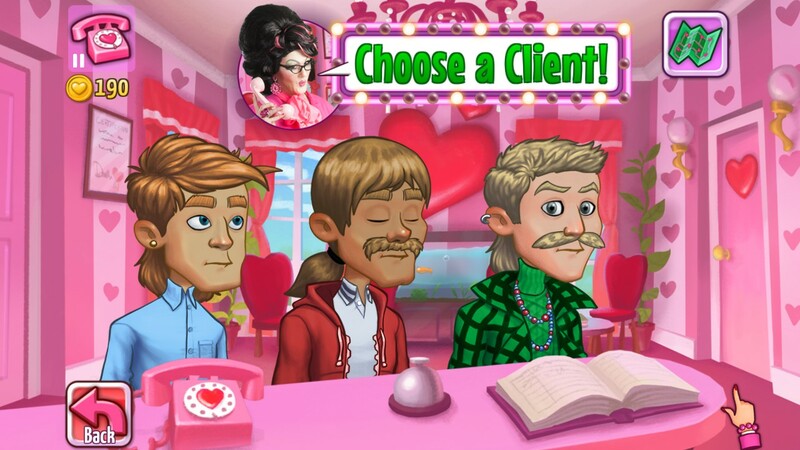 After creating your personal avatar and sitting through a short introduction from Kitty Powers – the game’s innuendo-loving drag queen mascot and somewhat unhelpful in-game guide – you’re introduced to your first client and instructed to take them to the ‘hot seat’. It’s here that the character will briefly explain what their occupation is, what their favourite things are and what they’re looking for in a partner. All of this information is summarized in their profile as you set about looking through a list of potential dates for them, with the interface helpfully highlighting anything that matches either your client’s or the potential date’s tastes. Your client’s preferences for a date are boiled down to each candidate’s interests, hair colour and eye colour. While this initially comes across as a bit superficial, there’s surprisingly a bit more at play here, and once you’ve trained yourself to understand each character’s personality and what other aspects of someone’s personality and appearance they might be into, it’s possible to have just as much success pairing up two people who don’t match each other’s indicated preference at all. In addition to being LGBT-friendly, the game is also very progressive in terms of moustaches. Once you’ve picked a suitable pairing, it’s time to decide on the location for the date. This will be one of several restaurants, each offering up a different cuisine, and the decision is made via a mini-game involving each type of cuisine being placed in a sealed envelope and shuffled around, before prompting you to open one and reveal where the couple will head off to. 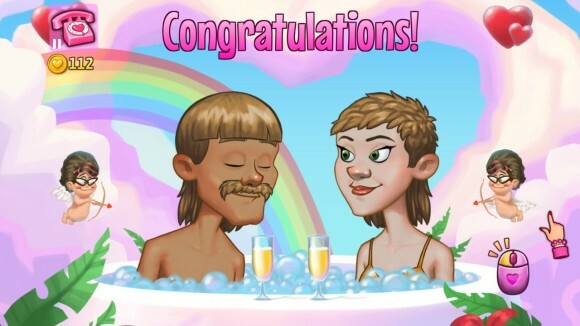 This mini-game sets the tone for the dating side of the game, and from the moment the couple arrive at the restaurant until the end of their evening together, their actions, dialogue and perceptions of each other will be determined by your performance in a semi-random selection of mini-games, ranging from challenging and entertaining to slightly frustrating. For the most part, these consist of memory games, which increase slightly in difficulty as you progress through the game and unlock higher quality restaurants. One of the main mini-games featured consistently and repeatedly on each date is referred to as pulling on the ‘Love Handle’, which sets the reels of a slots machine spinning. The icons on the resulting panels each represent a different conversation topic you can select, with some choices more risky than others, and some requiring a bit of foreknowledge or presumption about each of the characters. If your couple have occupations or interests that seem like they’d match in some way, then picking a conversation topic about either of these subjects is usually a safe bet and will – if successful – boost the couple’s attraction towards each other. However, picking a topic that conflicts between your client’s tastes and their date’s will give you a choice to spin ‘The Wheel of Misfortune’ and have your client attempt to lie about their tastes. At the end of each date, you’re given a choice to either tell your client to never date that person again, to ask them out on another date, or to ask them if they’d like to hook up for a more serious relationship (which apparently means jumping in a hot tub together and making kissing gestures at each other). Whether the latter option is successful – or even selectable – depends entirely on how each of the characters feels about each other, and it’ll sometimes take several dates before you force them to completely fall in love. For every successful date, you’ll increase your money, reputation and level. You can spend your money on a whole host of upgrades, including better restaurants or the ability to meddle in the lives of your innocent customers even more by dictating their choice of hair, clothes, makeup and facial hair before each date. 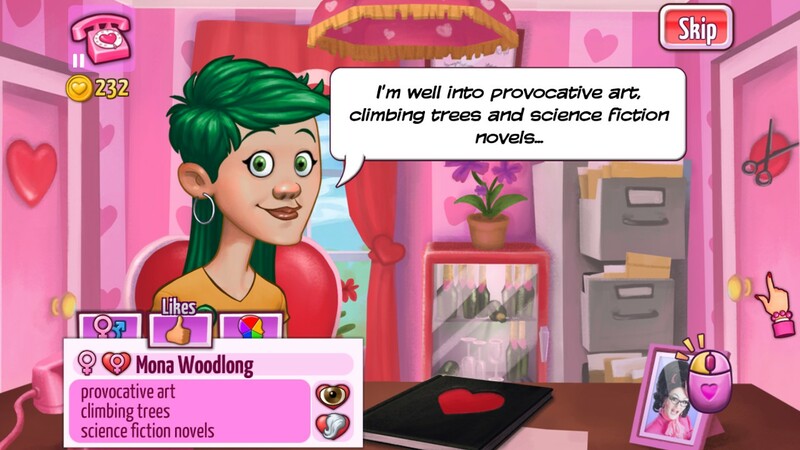 As you level up, you’ll unlock more options and abilities, as well as places to advertise your dating agency. Couples will also eventually send you letters to let you know how they got on and whether their relationship blossomed into anything else. You’re welcome! It was entirely my pleasure to meddle in your personal lives! All in all, Kitty Powers’ Matchmaker has surprising depth of gameplay and longevity hidden beneath its outward layers of crass humour and silly mini-games. If, like me, you enjoy playing with the lives of people and/or dressing up virtual characters (which, incidentally, is another popular genre of game!) then you could do far worse than giving this a shot. Kitty Powers’ Matchmaker is available now on PC, Android and iOS. Very pleased to hear that this game is actually worth checking out; the tongue in cheek humour sounds well-pitched for the concept. I’ll probably give this a try on my phonething, since the pace and the presence of minigames sounds ideal for that platform!